If you use "Per-Day" classes, you can also offer the choice of days for new customers using the web Registration Form. This is especially useful to week-long Summer Camp classes where you offer a selection of which days during that week the student wants to attend. For a full explanation of setting up and using "Per-Day" classes, see the Adding Per-Day classes page in this guide. 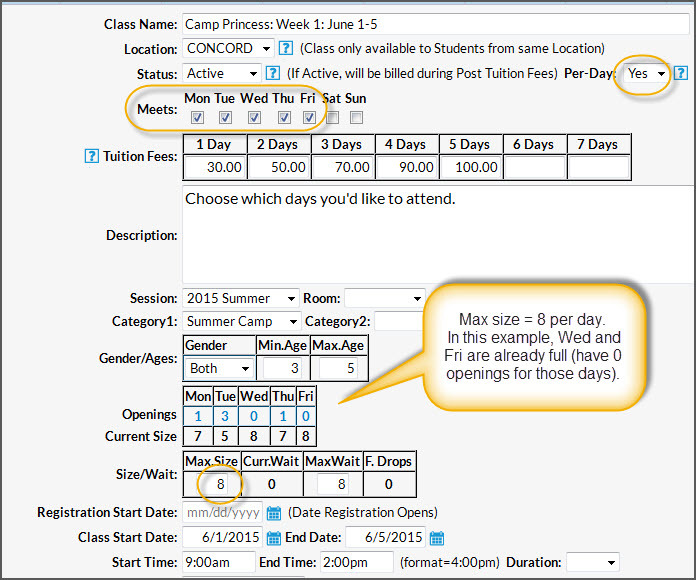 In this example of a Camp Week where the parent can attend any combination of days, notice the class is set up as a week-long Per-Day class and the maximum size is set at 8 students each day. If this class is selected online via the Registration Form, it will allow the parent to select which days to attend. If the day has 0 openings, it will say "Full" and can not be selected. However, if you use online Waitlisting, it will allow them either select available days to be enrolled into, OR, to select to be Waitlisted for any full days. At this time the parent can only select ONE bulleted choice - there is not a way to Enroll into open days and Waitlist into full days at the same time. Once submitted it will update your database just as regular class online enrollments do. The confirmation email to the parent and to you will show the Days selected as well.